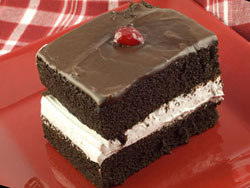 This HO HO Cake is make with devils food cake mix, baked in two layer and sandwiched between is a creamy filling. Cut the pieces on the smaller side as it is very rich. Prepare cake mix: Follow directions on package. Bake in 2 - 13 x 9 inch pans for 20 minutes, watch closely to not overbake. Let cool and take one of the pans of cake and turn upside down to release cake. Let it continue to cool completely on a wire rack. Prepare filling: Cream the sugar, margarine and shortening together, then add the vanilla and milk. Continue beating until thick and creamy smooth. Spread on the cake that is still in the pan. Put in refrigerator to chill. Prepare frosting: Melt chocolate chips and margarine together, stirring continuously.Remove from heat and slowly add egg, continue stirring vigorously to blend egg into chocolate. Cool slightly. Take cake from refrigerator and put the other cake that was cooling on the wire rack on top of the one from the refrigerator. Pour frosting over layers of cake. Cover and put back in the refrigerator to chill completely for at least two hours before serving.